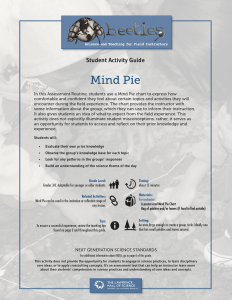 In this Assessment Routine, students use a Mind Pie chart to express how comfortable and confident they feel about certain topics and activities they will encounter during the field experience. The chart provides the instructor with some information about the group, which they can use to inform their instruction. It also gives students an idea of what to expect from the field experience. This activity does not explicitly illuminate student misconceptions, rather, it serves as an opportunity for students to access and reflect on their prior knowledge and experience. Evaluate their own prior knowledge. Observe the group’s knowledge base for each topic. Look for any patterns in the group’s responses. Build an understanding of the science theme of the day.